Washington fans watch their team during the second half of an NFL football game against Arizona on Sunday. And so NPR is pulling back on using the name of the Washington football team after all. NPR News does not plan to prohibit the use of the full team name. The team's name is the name and our job is to report on the world as it is, not to take a position or become part of the story. But, our policy on potentially offensive language states that "as a responsible broadcaster, NPR has always set a high bar on use of language that may be offensive to our audience. Use of such language on the air [and online] has been strictly limited to situations where it is absolutely integral to the meaning and spirit of the story being told." As a network, we do not have much occasion to report on this club. When we do, we can usually refer to it simply as "Washington" or "the team" once we've established that we're talking about the city's NFL franchise. This line, for example, was on our air after the firing of Washington's coach: "Last year the Redskins made the playoffs, this year they were only 3-13, Mike Shanahan was held to account." We could have said: "Last year Washington made the playoffs, this year the team was only 3-13, Mike Shanahan was held to account." Headlines about the team (on the few stories we might post about the club that aren't about the name controversy) can be a difficult issue. "Seahawks Crush Redskins" can be changed to "Seattle Crushes Washington." But "Giants Crush Redskins" can't become "New York Crushes Washington" because a reader wouldn't know if we're referring to the Giants or the Jets. Again, we are not prohibiting the use of the full team name. At times, it will have to be used – particularly when reporting about the controversy. At times, it may sound awkward to refer to the club as "Washington" or "the team." Clarity in our reporting is vital. In some cases, achieving that clarity will require using the team's name (for instance, to distinguish the club from Washington's other sports teams). Guests will surely use the word Redskins during interviews. But we can also be sensitive, avoid overuse of the word and use alternatives – as we would with other potentially offensive language. To my mind, this is in fact a very significant change, not only for NPR, but for the mainstream media in general. NPR becomes the first large national news organization to pull back on the use of a name that is a slur to many Native Americans. The original NPR directive was in a response to the reaction caused by an investigation I did on the name that concluded by recommending just this new policy. The hundreds of Native American organizations and tribes that have been pushing to ban the name altogether may be disappointed that NPR did not go that far. 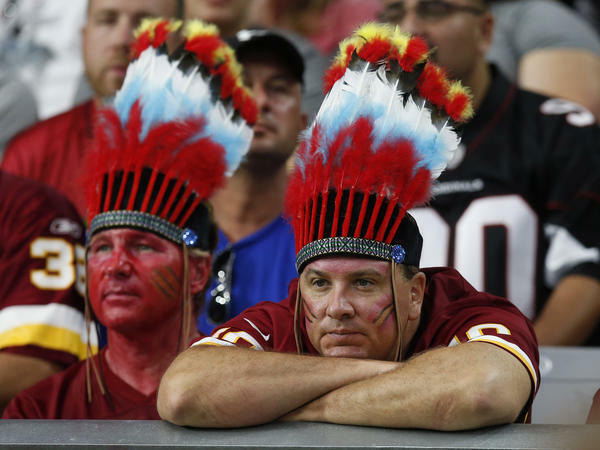 While I and many others inside NPR might personally agree with them on moral grounds, the issue is fuzzied by incomplete opinion polls of Native Americans and by the obvious lack of ill intention by football fans and the team's management. Many fans honestly think that they are honoring Native Americans, as team owner Dan Snyder claims, even though after months of trying, he has been unable to find few, if any, Native American leaders of any note who will agree with him. I suspect that, in practice, NPR will rarely, if ever, use the R-word again. Or, it will be couched in some way. What we are witnessing is a shifting media consensus on how to define and use a word with racial implications. We American journalists like to insist that it is not our responsibility to decide on what facts to report—"we report, you decide," goes the saying—but that is true only to a point, as NPR's own Code of Ethics states. For a smart analysis on how the news media arrives at an unstated consensus on something, read this story by one of NPR's own political reporters, Alan Greenblatt. What caused the recent NPR switch, Memmott said, was that local Washington member station WAMU asked to talk about the issue. "That led us to think more about our guidance," Memmott told me. "It seemed like we could sharpen the wording. I don't know what, if anything, WAMU will do." Already, The New York Daily News, The San Francisco Chronicle, The Kansas City Star, The Oregonian and dozens of small and medium-sized news organizations across the country refuse or rarely ever use the name. So do a growing list of sports commentators, athletes, political leaders, civil rights groups, education groups and churches. The Washington City Council, the New York and California state assemblies and President Barack Obama have come out against the name. Since the extensive analysis that I did in March, even the granddaughter of the team's founder George Preston Marshall, demands that the team change its name. History does not support that Marshall thought of honoring Native Americans when he picked the provocative name 81 years ago. The United States Patent and Trademark Office has declared the word a slur, and perhaps most ominous for a broadcaster such as NPR, the Federal Communications Commission is beginning to stir, too. In a recent interview with Broadcasting & Cable, FCC chairman Tom Wheeler declared the name offensive, but suggested that the team should change the name on its own accord. But some 100 groups and former FCC members are petitioning for the FCC to move against the messengers under FCC decency standards. Then there is the matter of morality that editors must consider, no matter what their interpretation of news ethics is. An article this month in Psychology Today pulls together the growing number of studies that show how the name undermines the sense of self-worth of many Native Americans, contributing to what on many reservations is by far some of the nation's highest levels of alcoholism, drug addiction, teenage suicide, unemployment and other ills. According to the research, many American Indians in effect feel bullied and fatalistically helpless to do anything about it. Editors must step cautiously in defining morality, but step they must sometimes. To shirk that responsibility is itself immoral. Matters of morality, moreover, are not just the responsibility of the newsroom, but of the executive suite, too. Editors rightfully defend their independence in making news judgments, but morality is a subjective matter that can affect the fundamental character, audience and legal standing of the news medium, making decisions at some point a management prerogative. The opposition to the name of the Washington team is not some new demonstration of political correctness, as many supporters of the name proclaim. Organizations such as the National Congress of American Indians have been fighting the name since the 1960s, but it is only now that they have the money and influence to be heard. NPR is doing the right thing to listen and act.